Each storage volume is a unique block device/target (a.k.a a 'LUN' as it is often referred to in the storage industry) which can be accessed via iSCSI, Fibre Channel, or Infiniband/SRP. A storage volume is essentially a virtual disk drive on the network (the SAN) that you can assign to any host in your environment. Storage volumes are provisioned from a storage pool so you must first create a storage pool before you can start provisioning volumes. 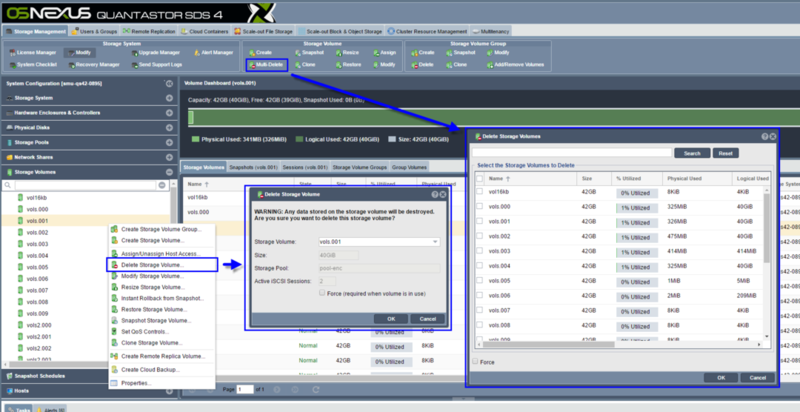 Storage volumes may be provisioned 'thick' or 'thin' which indicates the amount of pre-reserved storage assigned to the volume. Since thick provisioning is simply a reservation it can be adjusted at any time using the Modify Storage Volume dialog via the right-click pop-up menu after selecting a given volume. Choosing thick versus thin-provisioning has very little to no impact on the overall performance of the storage volume so the default mode and recommended mode is to use thin-provisioning. To create a large number of volumes all at once select a batch count greater than one. Batch created volumes will be named with a numbered suffix increasing from ".000", ".001", ".002" and so on. If a given suffix number is taken it will automatically be skipped. Volumes may be customized via the Create and Modify Volume dialogs to set a number of advanced settings including CHAP settings, and access mode settings. By default volumes are all read-write including storage volume snapshots. Read-only mode is useful for volumes that will be used as a template for cloning to produce new volumes from a common image to ensure that the template is not changed. The block size selection is only available at the time the volume is created and cannot be adjusted afterwards. In the Advanced Settings...' section one will see that the Block Size is set to Auto by default. In the Auto mode the block size for the storage volume will be set to 128K when the underlying Storage Pool for the volume has no SSD write log devices (SLOG/ZIL) configured. Once write log SSD devices (ZIL/SLOG) are assigned to the pool then the storage volume block size in Auto mode will be selected as 8KB (rather than 128K) so that the ZIL can engage for sync writes and small block IO will be grouped into larger transaction groups to boost IOPS performance. The 128K volume block size is optimal for pools without ZIL and the 8K block size is optimal for pools with ZIL. Be sure to configure the pool with write log SSDs before provisioning storage volumes as the block size cannot be changed later. There are two dialogs for deleting storage volumes, one for deleting individual volumes and one for deleting volumes in bulk which is especially useful for deleting snapshots. Pressing the "Delete Volumes" button in the ribbon bar will be presented the multiple Delete Storage Volumes dialog whereas right-clicking on a specific volume in the tree view will present one with the Delete Volume... option from the pop-up menu for single volume deletion. The multi-volume delete dialog also has a Search button so that volumes can be selected based on a partial name match. WARNING: Once a storage volume is deleted all the data is destroyed so use caution when deleting storage volumes. 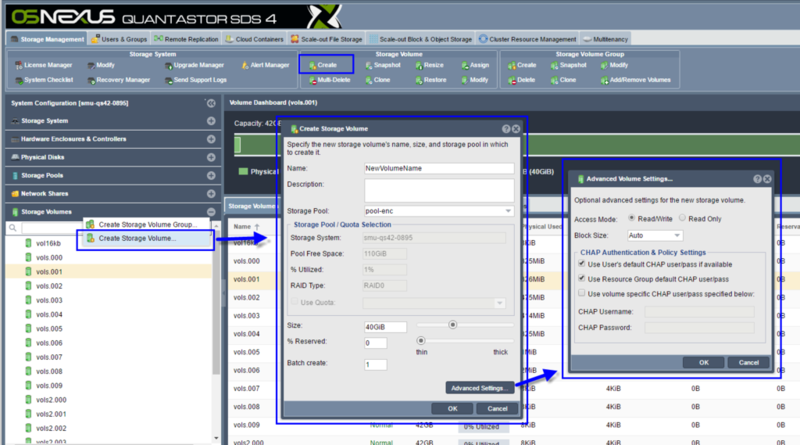 When QuantaStor systems are in a shared or multi-tenancy environment it is important to be able to limit the maximum read and write bandwidth allowed for specific storage volumes so that a given user or application cannot unfairly consume an excessive amount of the storage system's available bandwidth. This bandwidth limiting feature is often referred to as Quality of Service (QoS) controls which limit the maximum throughput for reads and writes to ensure a reliable and predictable QoS for all applications and users of a given system . Once you've setup QoS controls on a given Storage Volume settings will be visible in the main center table. QoS levels may also be set by policy. QoS Policies makes it easy to adjust QoS settings for a given group of Storage Volumes across the storage grid in a single operation. To create a QoS Policy using the QuantaStor CLI run the following command with the MB/sec settings adjusted as required. Policies may be adjusted at any time and the changes will be immediately applied to all Storage Volumes associated with the given QoS policy. QoS Policies may also be used to dynamically increase or decrease the maximum throughput for Storage Volumes at certain hours of the day where storage I/O loads are expected to be lower or higher. Note: QoS settings applied to a specific Storage Volume clear any QoS policy setting associated with the Storage Volume. The reverse is also true, if you have a specific QoS setting for a Storage Volume (eg: 200MB/sec reads, 100MB/sec writes) and then you apply a QoS policy to the volume, the limits set in the policy will clear the Storage Volume specific settings. QuantaStor supports increasing the size of storage volumes but due to the high probability of data-loss that would come from truncation of the end of a disk QuantaStor does not support shrink. To resize a volume simply right-click on it then choose Resize Volume... from the pop-up menu. After the resize is complete a signal is sent to the connected iSCSI and FC initiator sessions to let the client hosts know that the block device has been resized. Some operating systems will detect the new size automatically, others will require a device rescan to detect the new expanded size. In most cases additional steps are required in the host OS to expand partitions or other volume settings adjusted to make use of the additional space. QuantaStor supports creation of snapshots and even snapshots of snapshots. Snapshots are R/W by default and read-only snapshots are also supported. QuantaStor uses what we call a lazy cloning technique where the underlying clone to make a snapshot writable is not done until the snapshot has been assigned to a host. Most snapshots are created by a schedule and then deleted without ever being accessed, so the lazy cloning technique boosts the performance and scalability of the Snapshot Schedules and Remote Replication system. snapshots are 'thin', that is they are a copy of the meta-data associated with the original volume and not a full copy of all the data blocks. All of these advanced snapshot capabilities make QuantaStor ideally suited for virtual desktop solutions, off-host backup, and near continuous data protection (NCDP). If you're looking to get NCDP functionality, just create a 'snapshot schedule' and snapshots can be created for your storage volumes as frequently as every hour. To create a snapshot or a batch of snapshots you'll want to select the storage volume that you which to snap, right-click on it and choose 'Snapshot Storage Volume' from the menu. If you do not supply a name then QuantaStor will automatically choose a name for you by appending the suffix "_snap" to the end of the original's volume name. So if you have a storage volume named 'vol1' and you create a snapshot of it, you'll have a snapshot named 'vol1_snap000'. If you create many snapshots then the system will increment the number at the end so that each snapshot has a unique name. By default QuantaStor systems are setup with clone bandwidth throttling to 200MB/sec across all clone operations on the system. The automatic load balancing ensures minimal impact to workloads due to active clone operations. The following CLI documentation covers how to adjust the cloning rate limit so that you can increase or decrease it. qs-util clratelimitget            : Current max bandwidth setting to be divided among active clone operations. qs-util clratelimitset NN         : Sets the max bandwidth available in MB/sec shareed across all clone operations. qs-util clraterebalance           : Rebalances all active volume clone operations to use the shared limit (default 200). the file /etc/clratelimit.disable is present. The new rate is applied automatically to all active clone operations. QuantaStor automatically rebalances clone operation bandwidth, so if you have a limit of 300MB/sec with 3x clone operations active, then each clone operation will be replicating data at 100MB/sec. If one of them completes first then the other two will accelerate up to 150MB/sec, and when a second one completes the last clone operation will accelerate to 300MB/sec. Note also that cloning a storage volume to a new storage volume in the same storage pool will be rate limited to whatever the current setting is but because the source and destination are the same it will have double the impact on workloads running in that storage pool. As such, if you are frequently cloning volumes within the same storage pool and it is impacting workloads you will want to decrease the clone rate to something lower than the default of 200MB/sec. In other cases where you're using pure SSD storage you will want to increase the clone rate limit. If you've accidentally lost some data by inadvertently deleting files in one of your storage volumes, you can recover your data quickly and easily using the 'Restore Storage Volume' operation. To restore your original storage volume to a previous point in time, first select the original, the right-click on it and choose "Restore Storage Volume" from the pop-up menu. When the dialog appears you will be presented with all the snapshots of that original from which you can recover from. Just select the snapshot that you want to restore to and press ok. Note that you cannot have any active sessions to the original or the snapshot storage volume when you restore, if you do you'll get an error. This is to prevent the restore from taking place while the OS has the volume in use or mounted as this will lead to data corruption. was written to the original since the time the snapshot was created will be lost. to a previous point-in-time snapshot. Hosts represent the client computers that you assign storage volumes to. In SCSI terminology the host computers initiate the communication with your storage volumes (target devices) and so they are called initiators. Each host entry can have one or more initiators associated with it and the reason for this is because an iSCSI initiator (Host) can be identified by IP address or IQN or both at the same time. We recommend using the IQN (iSCSI Qualified Name) at all times as you can have login problems when you try to identify a host by IP address especially when that host has multiple NICs and they're not all specified. For details of installation please refer to QuantaStor Users Guide under iSCSI Initiator Configuration. Sometimes you'll have multiple hosts that need to be assigned the same storage volume(s) such as with a VMware or a XenServer resource pool. In such cases we recommend making a Host Group object which indicates all of the hosts in your cluster/resource pool. With a host group you can assign the volume to the group once and save a lot of time. Also, when you add another host to the host group, it automatically gets access to all the volumes assigned to the group so it makes it very easy to add nodes to your cluster and manage storage from a group perspective rather than individual hosts which can be cumbersome especially for larger clusters. Migrating LUNs (iSCSI and FC block storage) from legacy systems can be time consuming and potentially error prone as it generally involves mapping the new storage and the old storage to a host, ensuring the the newly allocated LUN is equal to or larger than the old LUN and then the data makes two hops from Legacy SAN -> host -> New SAN so it uses more network bandwidth and can take more time. QuantaStor has a built-in data migration feature to help make this process easier and faster. If your legacy SAN is FC based then you'll need to put a Emulex or Qlogic FC adapter into your QuantaStor system and will need to make sure that it is in initiator mode. Using the WWPN of this FC initiator you'll then setup the zoning in the switch and the storage access in the legacy SAN so that the QuantaStor system can connect directly to the storage in the legacy SAN with no host in-between. Once you've assign some storage from the legacy SAN to the QuantaStor system's initiator WWPN you'll need to do a 'Scan for Disks' in the QuantaStor system and you will then see your LUNs appear from the legacy SAN (they will appear with devices names like sdd, sde, sdf, sdg, etc). To copy a LUN to the QuantaStor system right-click on the disk device and choose 'Migrate Disk...' from the pop-up menu. You will see a dialog like the one above and it will show the details of the source device to be copied on the left. On the right it shows the destination information which will be one of the storage pools on the system where the LUN is connected. Enter the name for the new storage volume to be allocated which will be the destination for the copy. A new storage volume will be allocated with that name which is exactly the same size as the source volume. It will then copy all the blocks of the source LUN to the new destination Storage Volume. QuantaStor includes iSCSI Software Adapter support so that one can directly connect to and access iSCSI LUNs from a SAN without having to use the CLI commands outlined below. The option to create a new iSCSI Software Adapter is in the Hardware Enclosures & Controllers section within the web management interface. This command will install the iSCSI initiator software (open-iscsi). 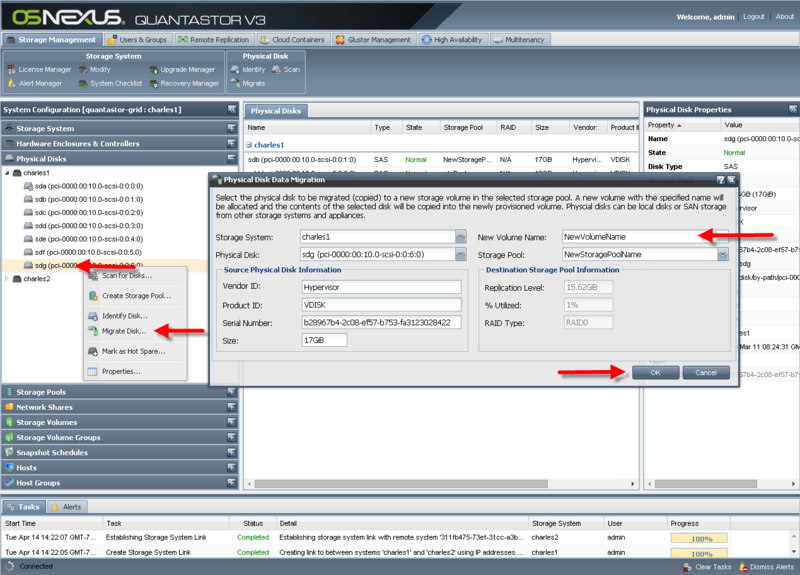 This command will show you the iSCSI IQN for the QuantaStor system . You'll need to assign the LUNs in the legacy SAN that you want to copy over to your QuantaStor system to this IQN. If your legacy SAN supports snapshots it's a good idea to assign a snapshot LUN to the QuantaStor system so that the data isn't changing during the copy. In the command above, replace the example 10.10.10.10 IP address with the IP address of the legacy SAN which has the LUNs you're going to migrate over. Alternatively, you can use the iscsiadm command line utility directly to do this step. There are several of these iscsi helper commands, type 'qs-util' for a full listing. Once you've logged into the devices you'll see information about the devices by running the 'cat /proc/scsi/scsi' command or just go back to the QuantaStor web management interface and use the 'Scan for Disks' command to make the disks appear. Once they appear in the 'Physical Disks' section you can right-click on them and to do a 'Migrate Disk...' operation. 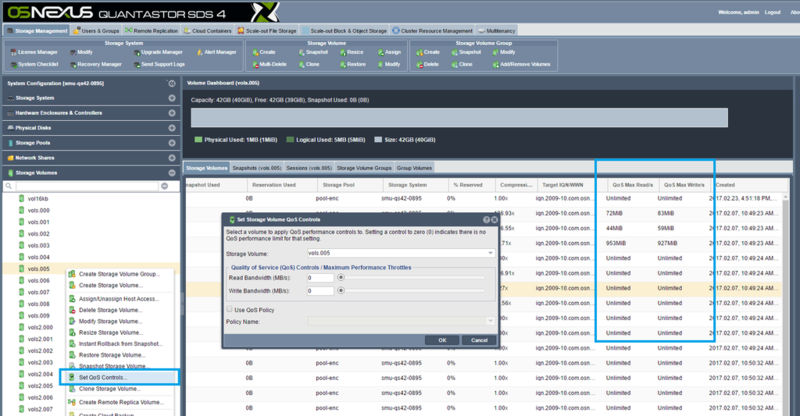 A list of active iSCSI sessions for a given volume can be found by selecting the Storage Volume in the tree section and then select the 'Sessions' tab. The Sessions tab shows both active FC and iSCSI session information. To drop an iSCSI session simply right-click on a session in the table and choose Drop Session... from the pop-up menu. Note: Some initiators will automatically re-establish a new iSCSI session if one is dropped by the storage system. To prevent this, unassign the Storage Volume from assigned Host or Host Group so that the host may not automatically re-login. This page was last modified on 17 April 2019, at 07:55.